Disclaimer: I was invited by a friend to Ramen Champ and did not pay for my meal. 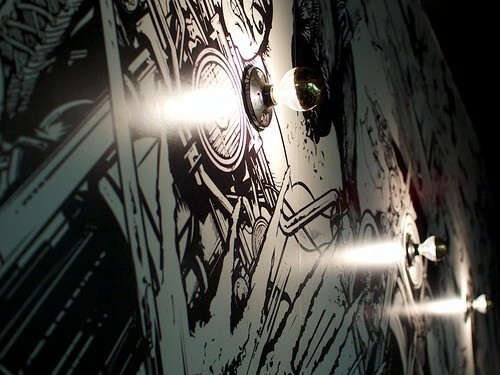 When I first walked into the small ramen restaurant, what caught my eye was the bold black on white drawings on the wall. If you look carefully, you’ll see a narrative created by noodles. While plenty of places are nice to look at, I’m glad to say that Ramen Champ has both style and substance. It’s a rare thing to have a place offer vegan ramen. It’s a rarer thing for this place to not only be a normal restaurant offering non-vegan options, but also have one of the best bowls of ramen in LA. 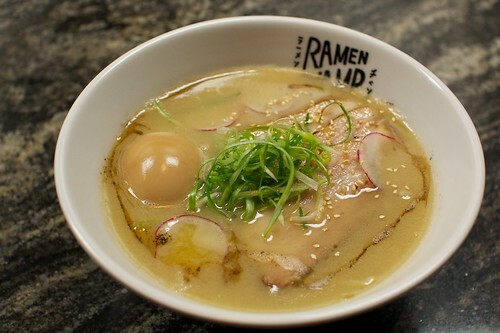 The tonkotsu ramen here is not for the faint of heart. Literally. The amount of pork packed into this bowl of ramen should come with a warning label like the ones on roller coasters. The rich soup is less of a broth and more of a porky gravy that coats each strand of chewy noodle to make a perfect mouthful. The toppings include curling slivers of green onion, crunchy slices of radish, a soft boiled egg, sliced pork belly, and a drizzle of garlic oil. As much attention should be paid to the flavorful, slightly sweet, soft slices of pork as to the broth. 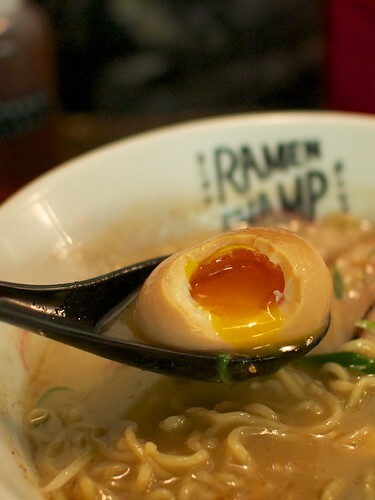 Then there’s the soft boiled egg. Oh, that egg! The soy-seasoned egg easily gives way to a molten yolk that barely manages to stay together. On the other end of the spectrum is the vegan ramen*. I’ve had a lot of vegan ramen in my life and this is the best. The mushroom broth is seasoned so that the sometimes overwhelming taste of mushroom is brightened and actually tastes like a ramen broth, including that oily mouthfeel. 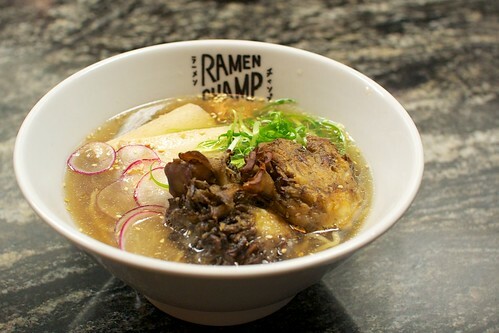 The toppings — hen of the woods mushroom, seasoned slices of tofu, radish, and green onion, all work to create a cohesive bowl of ramen. One of the shortcomings I always see in restaurants attempting a vegan ramen is trying to get too creative by throwing kale, broccoli, spinach, or even sesame paste in. Ramen Champ doesn’t fall into those traps and instead stays focussed on giving vegetarians a taste of what everyone else is eating. I would have already been happy if this place offered good ramen, but the non-ramen dishes on the menu were notable as well. 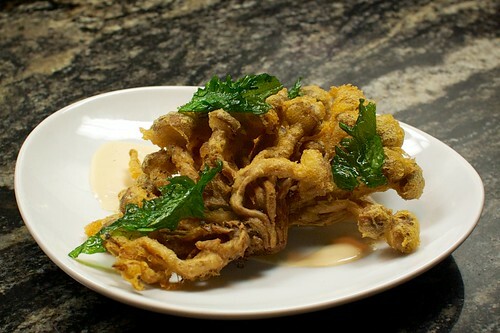 The mushroom tempura has shimeji mushrooms in a delicate and crunchy batter accented with a few shiso leaves. 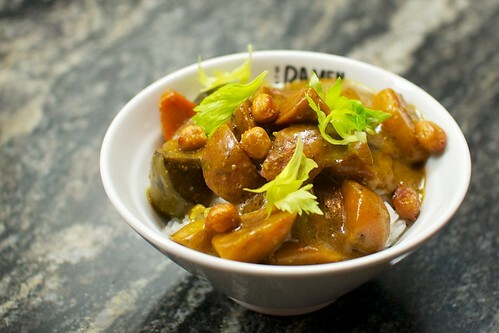 The vegetable curry (which also happens to be vegan) is made with a fragrant house-made curry powder which is worth trying if you’ve only had the stuff that’s come out of an S&B can. Then, if that wasn’t enough, there are also house-made condiments to jazz up the ramen. 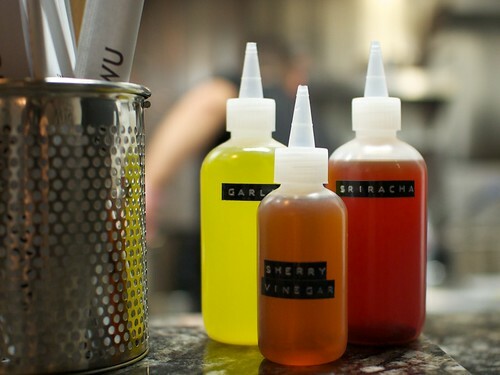 For a little heat, try the sriracha infused chili oil, which made my mouth do a double-take. I heard there will also be a house-made Japanese seven-spice (togarashi) in the future. 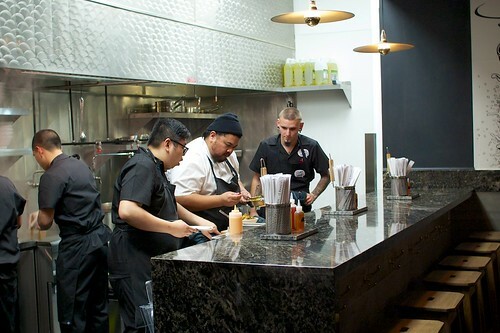 With all these tasty options to order off the menu, and the attention and care put into even minor things like condiments, I won’t be surprised if Ramen Champ ends up having lines like its forerunner, Eggslut. It does make me sad that this will probably be one of the few times I’ll be able to just stroll in and pull up a stool under the monochromatic mural and slurp a bowl of ramen without having to wait or battle crowds. * Normally, this option appears as vegetarian ramen on the menu, but if you’re vegan, make sure to let the server know so that the egg will be left out and the usual noodles will be swapped out for eggless noodles. I was craving a comforting bowl of rice noodle soup but didn’t want to drive all the way to the SGV, which was how I ended up at Mien Nghia in Chinatown. The place has been around for a long time and is known for their noodle soups, but surprisingly, I’d never gone until this time. When I walked in, I was greeted with a sticky table and surly service, both signs that this place may be legit. After grabbing a dirty menu from the counter myself, I decided on what amounts to the house special noodle soup. 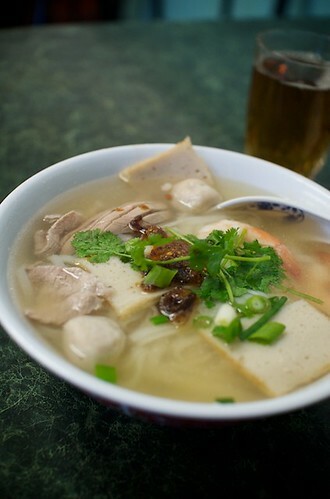 Thick, flat rice noodles in a chicken broth were topped with kidney, fish balls, slices of what I call Vietnamese spam (thin slices of some sort of meat paste), juicy, plump shrimp, and some fried shallots. It hit the spot. The soup was piping out, the broth chickeny and mild, and the noodles were perfect. What’s that? 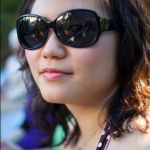 The health board wants us to refrigerate rice noodles for sanitary reasons? F-that! Why ruin the delicate texture of these slippery noodles with refrigeration? My mom who’s been making pho for years leaves the noodles out for whole days and no one in my family has gotten sick from it yet. Although the broth was fine as is, I spied a jar of satay sauce on the table and put a tentative amount in my soup. It gave it a completely different flavor — a flavor that I really liked, so I threw in a larger scoop. It gave the broth a nutty, slightly spicy taste. When I was there for lunch, there were signs posted on the walls about a free dessert drink with each entree order. It’s the ubiquitous drink with coconut milk and sweet beans over shaved ice. I was disappointed to see that the waiter didn’t even mention my free drink until I asked about it and by that time, I was too full. If you see the signs and want to get your free dessert, make sure to speak up because they sure as hell won’t volunteer any information. Charmingly surly service and a satisfying bowl of noodles. I was in and out in less than 30 minutes and only about $7 dollars lighter. What else could I ask for in a weekday lunch? I guess I could have asked for my free dessert, but other than that, it was a pleasing experience.